Arizona stands out in higher education according to a new report from the Center on Budget and Policy Priorities. But it’s not because of our innovative programs, cutting edge research, or amazing graduates. Between 2008 and 2015, Arizona had the largest percentage cuts to higher education funding per student and the highest percentage increase in university tuition. Both of these trends limit access to higher education and diminish Arizona’s workforce and economic competitiveness. The report cites research showing that higher education attainment is associated with civic engagement, home ownership, business start-ups, and lower crime rates. But Arizona’s investment was already low in 2008 before the recession. 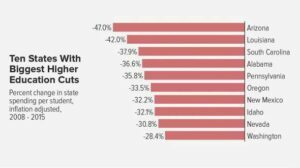 By 2015 Arizona state higher education funding per student had dropped to 49th in the country – this low ranking doesn’t even count the large additional budget cuts that will go into effect July 1. 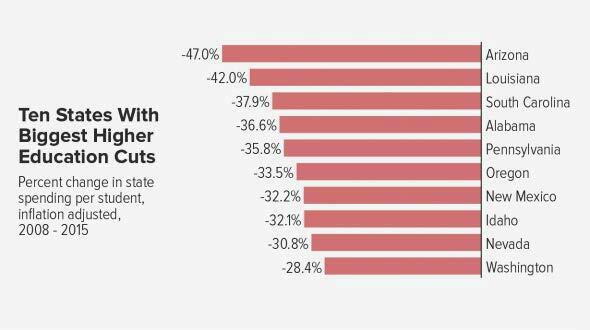 One of the trends linked to shrinking investments in higher education in Arizona and other states has been shrinking the tax base with tax cuts and tax credits – and no replacement revenue. Arizona lawmakers have enacted 25 years of consistent tax cuts; these cuts to the revenue side of the ledge have led to cuts on the spending side in all aspects of education – K-12, community colleges, and universities. Arizonans can expect higher education to remain on the chopping block in future years as Governor Ducey has signed into law several additional tax cuts that shrink revenue beginning this year. You can read Years of Cuts Threaten to Put College Out of Reach for More Students to see how Arizona compares to other states and how cuts to state spending jeopardize our state’s future. The report was also featured this morning on the front page of The Arizona Republic, with reactions from legislators and Dana Wolfe Naimark, CAA President and CEO.